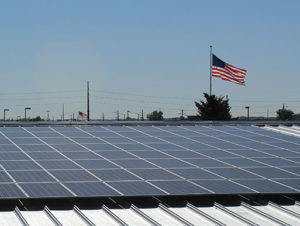 A solar array on top of Kinzler Construction Services’ Ankeny, IA warehouse. Kinzler Construction Services employees are celebrating Iowa’s sunny, hot summer days. That’s because the insulation and construction supply company recently activated 622 solar panels on top of its massive, recently-renovated warehouse in Ankeny. 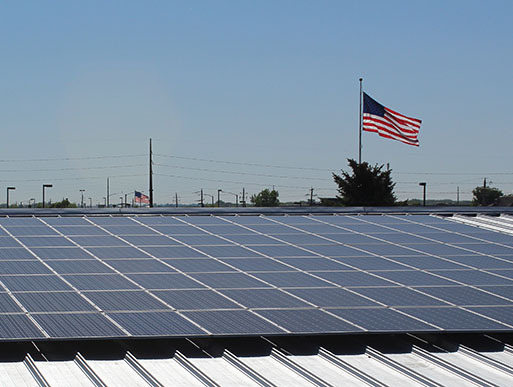 Kinzler’s 202.15 kW solar array was purchased and installed by Iowa State University graduates at Des Moines-based CB Solar Inc. The solar panels will produce energy at Kinzler Construction Services for the next 30+ years. The solar panels are one of the finishing touches on Kinzler’s substantial renovation of approximately 110,000 square feet of office and warehouse space at 700 SE Oralabor Rd. in Ankeny. The company plans to add 44 new jobs as a result of this project over the next three years. “We’re excited to now be able to better serve our customers from this renovated space,” said Kinzler.